The official blog of the Cleveland Indians Community Outreach Department. I grew up on the east side of Cleveland (what up 440!?) in a great town called Burton. If you ever go there, don’t expect to see a stop light, because we don’t have one. Don’t expect to see shopping plazas or public transportation vehicles either (expect maybe an Amish taxi or two). If you want to got to see a movie, grocery shop or anything entertaining you have to drive at least 20 minutes–we call it ‘going into town.’ Yes, we Burtonians are far away from the craziness that is the real world and that’s what I love about it. If it wasn’t for Burton, I probably wouldn’t really argue over the age-old question of which is better: the east side or the west side? Currently, I live on the west side (get over yourself 216, my phone number still is 440). I went to college on the west side and then kind of got stuck out this way. I like the people and it is nice to only drive 2 minutes to Target or the mall or McDonald’s. I also like that it is only a 13 minute drive to work here at Progressive Field. It makes life a lot easier if you want to do anything. Unfortunately, my heart belongs to the east side and hopefully within the next year or two, I will make my way back to settle down and raise some kin (and a little more cain) of my own there. What does the above story have to do with what the Indians did in the community? Absolutely nothing. I just needed a story to tell that mentions the west side. Kind of a lame transition into my summary about how the Indians volunteered at the West Side Boys and Girls Club the other day. You people will read anything! 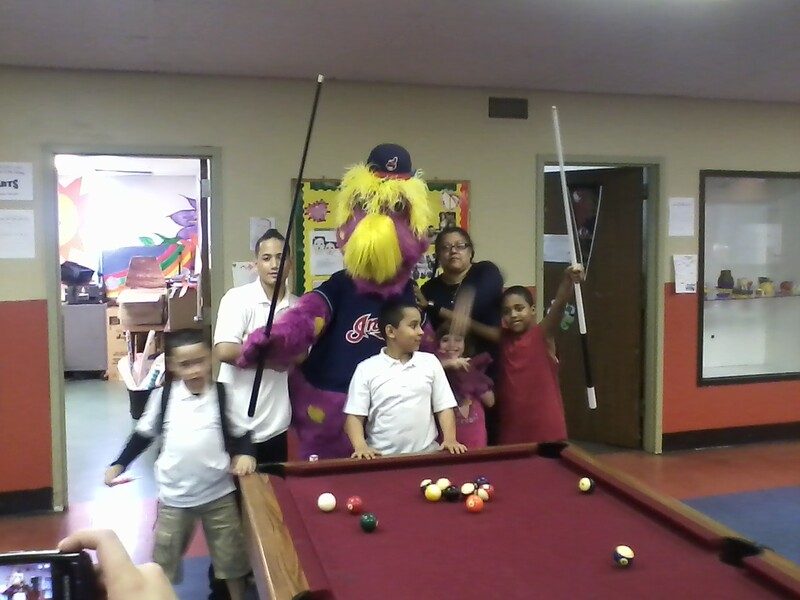 On Monday, members of the Cleveland Indians front office went to hang out at the West Side Boys and Girls Club. They helped the members with homework, played basketball, ping-pong and shot some pool with them. Slider even made a visit to the club, which seemed to excite the kids more than having us there. The club is open for the kids from 3:00pm to 7:00pm every day so they can come straight from school if they want. In order to be a member, the parent has to fill out an application and, of course, there are rules that the kids have to follow when they are there. Dinner is provided for the kids if they want it (which the Indians brought pizza and pop–sorry healthy food people). It is truly an amazing thing to talk with some of these kids. Some of their stories are pretty intense and it boggles my mind the things that they have to deal with on a daily basis. The Boys and Girls Club keeps them on the right track and they all seem to enjoy being there. You’ll see the older kids helping out the younger kids with homework, or teaching them how to play games. They all seem to watch out for each other and that is one of the many reasons the Cleveland Indians are proud to support The Boys and Girls Clubs of Cleveland. We plan on seeing all of these kids more throughout the season as we invite them down to games and events! dennis on Vinnie Pestano praises player (alliterations are fun)!